UPDATE: Congratulations to our winner! Here we are, at the point in the summer when it’s time to start planning for the next school year! How is that even possible? In our area of the globe we are returning to school August 16…which means we only have about four weeks left! It seems that every year that first day appears out of nowhere even though we’ve spent some time getting our (back-to-school) ducks in a row. Moms end up feeling overwhelmed, a little worn out, and a bit neglected during this time of the year. That’s why we thought it would be amazing to create a giveaway specifically for all the razzled and frazzled mommas out there. 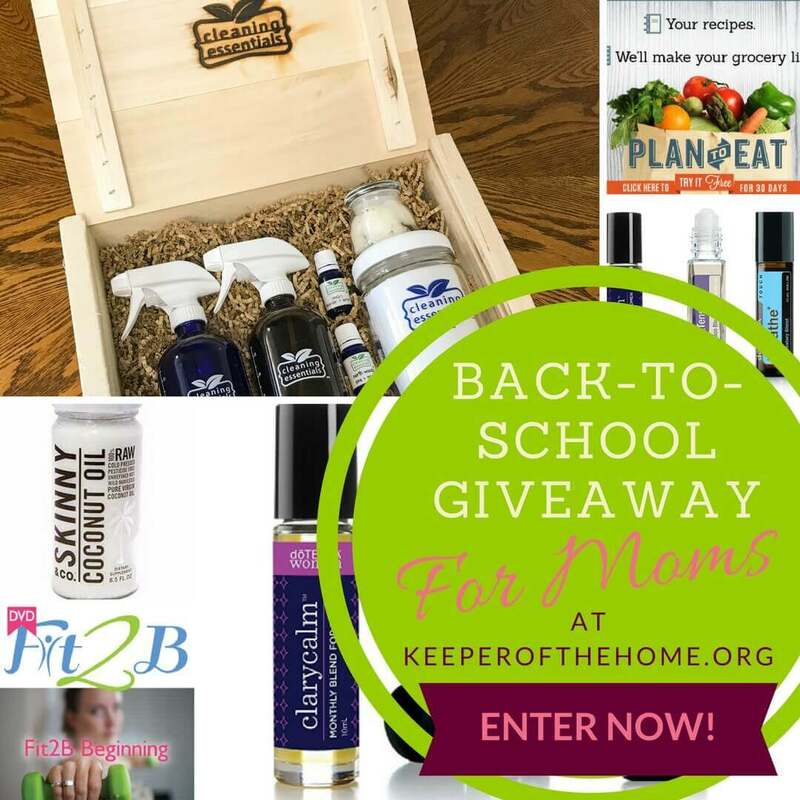 This Keeper giveaway showcases some of our favorite and good-for-the-soul products. Whether your kids are going to public school, private school, or homeschooling, I’m sure you can identify with the amount of stress of traversing the empty aisles to find last minute notebooks or the right kind of 11-pocket folders: two yellow, two blue, two green, two white, three purple, all with clasps and 3 holes! 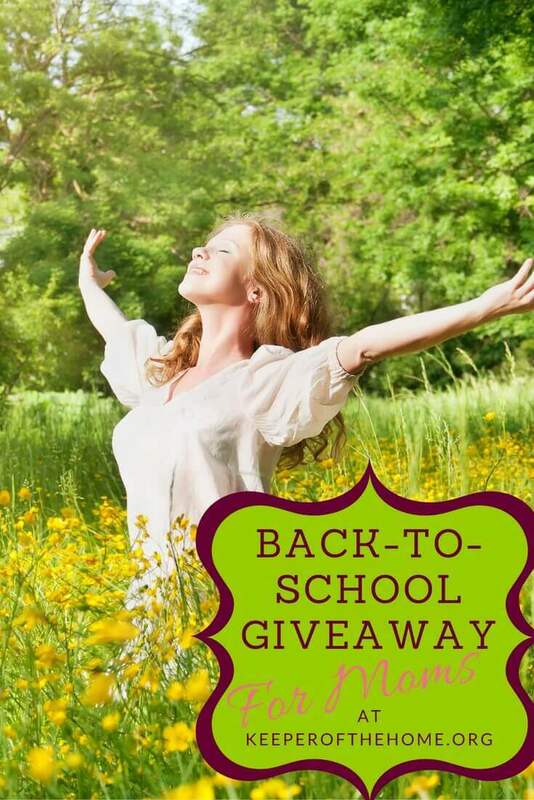 This back-to-school giveaway is for you, moms. It’s something special to thank you for being a mom. Remember to take care of yourself and to take a minute to breathe. Don’t let the chaos drag you down: keep smiling, keep trusting God, and keep at the most important work you can do! 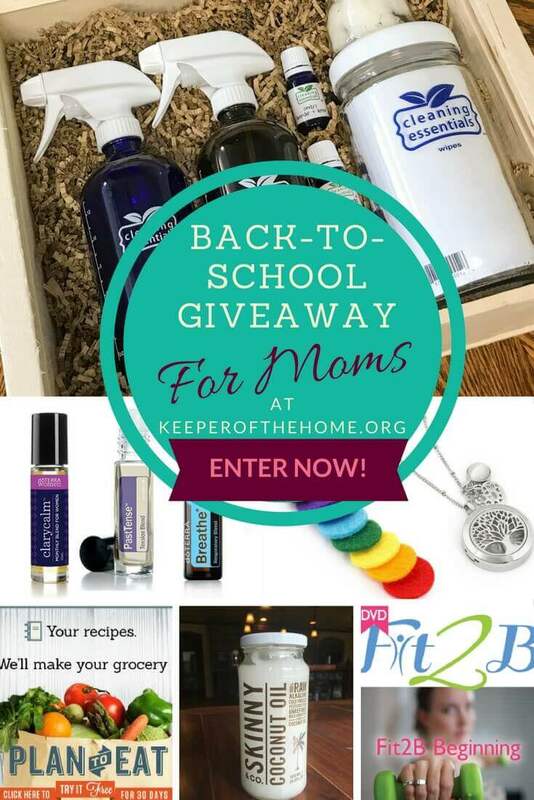 This Keeper of the Home Back-to-School Giveaway for Moms is worth $373.67!!! We’ve been working hard to find just the right combination of awesome and useful and fabulous, and we think we’ve done it! 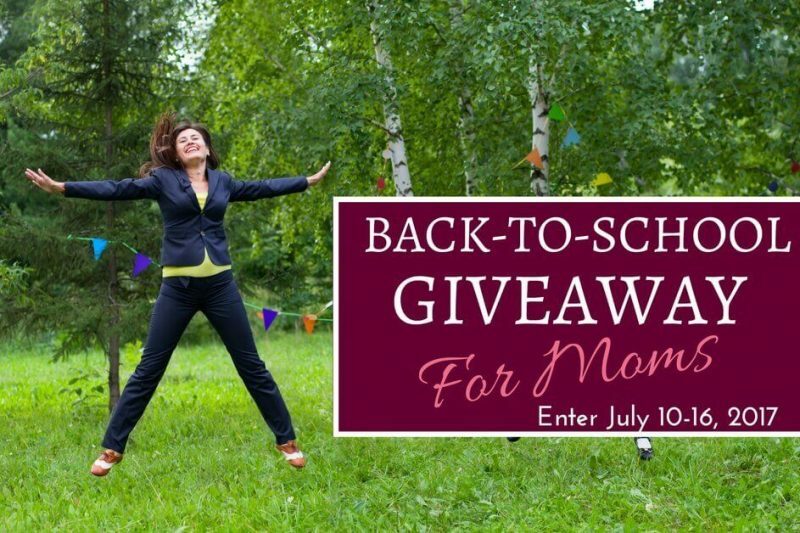 Check out our favorite back-to-school essentials for moms and enter below for a chance to win. Enter up at the bottom of this post between today (July 10) and Sunday, July 16 at 11:59 PM EST. AromaLove London’s Silver Tree Of Life Aromatherapy / Essential Oils Diffuser Necklace is beautifully constructed, high-quality lockets are specifically designed with ventilation holes to gently diffuse your favorite scent. These vents allow you to get the full effects of your aromatherapy oils throughout the day and night. Made of 100% surgical grade (316L) stainless steel with heavy locking magnets and a solid back, these lockets are built to last for everyday use without staining your skin or clothes. Fit2B Studio specializes in strengthening cores that have been through a lot… We know how abdominal trauma can have a domino-effect on your whole body. You can trust that all of our workouts – and we have a LOT of them – will restore, rebuild and reshape you without wrecking your progress. Your Warmup For Life: Streaming Tummy Safe Fitness Wherever You Are. 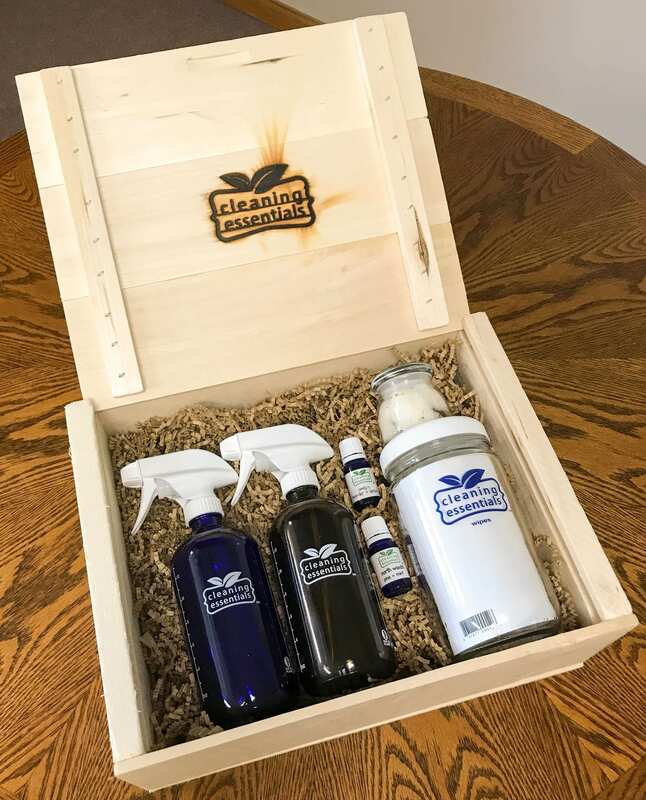 Cleaning Essentials is a company dedicated to helping families replace store-bought household chemicals with safe, non-toxic homemade cleaning solutions powered by the natural antibacterial and aromatic properties of Essential Oils. They procure their own essential oils only from sustainable sources, and work closely with suppliers and distributors to ensure the purest Essential Oils for the most reasonable price. Durable, refillable 16 oz amber glass sprayer bottle makes it easy to replace wasteful store-bought chemical cleaners with all-natural, non-toxic homemade cleaners you make yourself at home. Simply choose a recipe, add ingredients to the fill lines on the bottle, shake, and you’re ready to clean! 16 oz. Cobalt Blue Glass Spray Bottle for DIY Cleaning with Essential Oils; 5 Non-Toxic, all-natural homemade cleaning recipes printed right on the side. Durability Guaranteed. Made in USA. Sprayer w/ stream, mist & off settings. Reusable Wet Wipes- DIY Container for Reusable Cleaning Wipes – 32oz glass jar has instructions to make your own zero-waste, non-toxic, safe & effective eco-conscious wet wipes using essential oils. 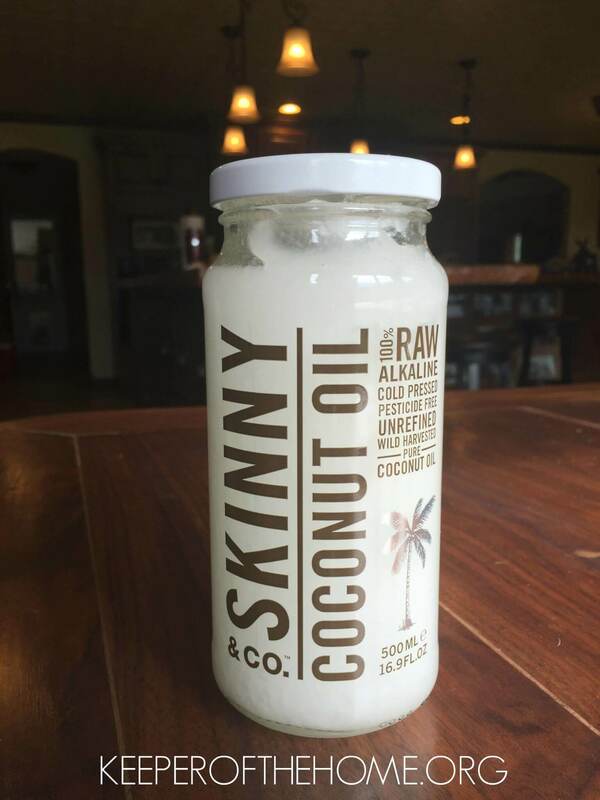 Skinny Coconut offers high-grade coconut oil and beauty products that are free of toxins. Ingredients that are found 100 percent from the Earth with no preservatives and no artificial added ingredients – from tree to table. Coconuts are wild harvested and manually extracted at low temperatures near 80 degrees, preserving the delicate enzymes and maintaining a high nutritional value. Skinny & Co gives back 10% of proceeds to build schools, teach English and fund year-round farming in Vietnam. Click here to learn more about coconut oil, my favorite tips for how to use coconut oil, and how I determine what kind of coconut oil is best. This is a remarkable blend of essential oils including Laurel Leaf, Peppermint, Eucalyptus, Melaleuca, Lemon, Cardamom, Ravintsara, and Ravensara. 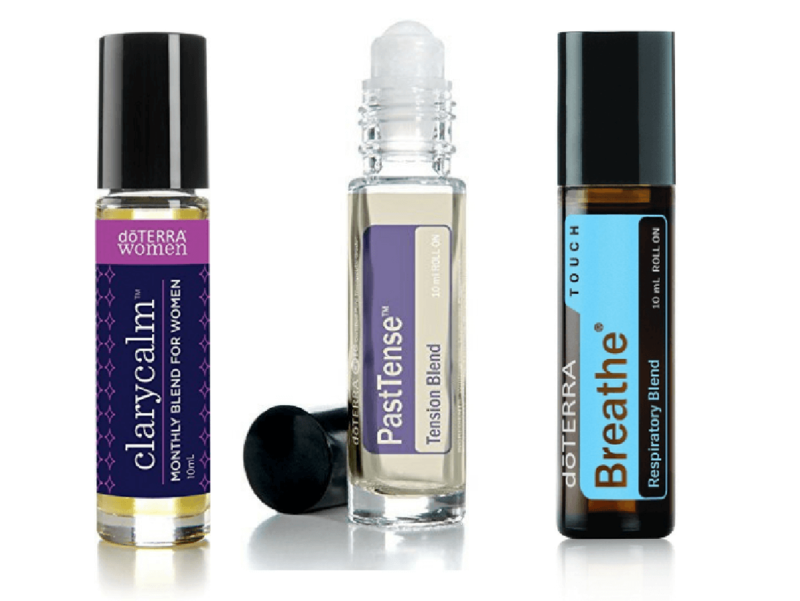 doTERRA Breathe maintains feelings of clear airways and easy breathing while minimizing the effects of seasonal threats. doTERRA Breathe can be applied topically to the chest, back, or bottom of feet, or diffused at nighttime to calm the senses and promote a restful sleep. Yay, it’s working! We homeschool so although there is maybe less ‘back-to-school’ frenzy, I do take quite a bit of time in June and July to sift and purge old materials, reorganize our cabinet, make a curriculum doc for next year and check out new materials for the next year. It makes me feel like I have headspace to start over! I try to make it a fun treat to gather supplies and get organized so that back-to-school is something to look forward to! Because we homeschool basically year round, either at the end of August or the beginning of September (whenever I designate the “official” beginning of the new year – I try to slowly ease our teens back into their normal year routines. This includes introducing new subjects over a period of time and making sure we already have all necessary supplies and materials on hand. We have routines set up and I spend time teaching, reinforcing the routines and adjusting the routines as needed. I really need that cleaning essentials box. I’m trying so hard to detox our home and minimize waste at the same time, but it’s so overwhelming going through all the different suggestions on the internet. To try and make lists to keep organized! haha, I’m not sure I have tips for back to school chaos! I do like to plan ahead and be flexible (we homeschool). Since I homeschool, and I’m new to it, I try to have a plan and be flexible with it. Back to school is stressful to me, but I try to make it really fun for them by starting with shopping for new school supplies. That was my favorite thing to do as a child. I have my kids clothes laid out the night before and snacks packed. I try to keep a daily routine to ensure everything that I need to get done and want to get done is completed. Doing the same things in a specific order everyday helps me to go on auto pilot because it then becomes a habit! I start shopping early…like now! LOL I have already started shopping for supplies and have almost half of dd’s looooong list done! We clean out our dressers and closets in the summer for clothes we know won’t fit into the new school year. Then we dontate them to local charities. This helps my kids learn that donating clothes they have grown out of can help other kids get ready for school too. Make a plan, try to stick to it, and PRAY every day! Our church is having a backpack drive for a school near us. I’m checking Amazon Prime Day deals today. I love that the name of the coconut oil is “Skinny”. Makes me giggle: skinny fat! While I am a Grandmother now, 4 of our grandchildren live with us and 3 are school age! All of our children and their families transitioned from California to rural Oklahoma 3 years ago! Every August the school shopping starts! I’m blessed to be a part of their everyday lives! It’s hectic but I wouldn’t have it any other way! This giveaway is such a blessing! WOW!! What nice treats to get started for the new school year! I try to have the schedule complete and the supplies ready, then we start the year with a special “first day breakfast” and pictures for an official start to the year. My kiddos started back today as we are a year round school. This year is my first year in 10 years that all of my kiddos are in school and I have 4 hours to myself. I don’t even know what to do it was overwhelming to think I can get all my housework done without any mommy guilt! A written schedule is my way of staying sane! My main tip is make lists! I add the to-dos to my calendar – you know, schedule them right in there so that they are marked as important. Then I make lists of what the children need like shirts, jeans, socks, etc. Then there’s a list of the things I need to do before school starts: doctor and dentist appointments. Then there’s the random list like hair appointments, etc. These would definitely boost my school year beginnings! I make lists the year before (as I’m prepping). This takes away some of the stress. What are your tips for dealing with the chaos and crazy of back-to-school? Preparing Weeks ahead of time to get our Family back in the School Routine!! I try and keep things simple, get the basics done and don’t worry so much about the rest. I pull up the school calendar and put everything into my phone calendar & a large calendar on our front door as soon as the school sends it. You can’t leave the house without seeing the calendar, so it makes it harder to forget school events/project due dates, etc. I always buy a few extra items at the beginning of the year so I check my on hand before shopping…I also donate to the teachers wish list from my surplus. I have been following you for years and absolutely LOVE all of your posts. You have helped me and my family so much. I truly appreciate you!! We order all our school supplies online (Amazon or Staples) to avoid craziness in the stores. Love the tips and comments! I need to do more for organizing healthy food so I’m ready for the year. Already gone througlast year’s school supplies to reuse/recycle. Proper amounts of sleep for everyone’s is helpful. Working of staying as close as possible to the normal schedule also helps. I try to nail down exactly what we are looking fr before we hit the stores. I also try to be as prepared as possible before school starts. Try to plan in advance all that needs to be done, what needs to be bought, a good night’s sleep & try to tackle it all during the weekend of our no tax holiday for back to school. Rarely does it go as planned but much better than winging it. Thank you for the chance to win this amazing giveaway. Early bedtime a week before! We go shopping early to beat the crowds. Always pick out clothes and pack bags the night before and get to bed early! The giveaway sounds amazing! Shop early and use apps/ blogs to find deals. Plan ahead. Shop ahead. Stay positive. Don’t stress, go slow adding a few things in as you go. Our first day back is a day of gifts – something fun to use for school and fun stuff (headphones, books, etc.). Keep everything as simple as ypu can. Simple lunches with healthy food, one or no after school activities, just enough school supplies and clothes for each kiddo, and no rushing! . Plan ahead and give yourselves 15 extra minutes in the morning. Everything takes longer than expected. If it truly is extra time, use it to pray together or sing a song or just hug them an extra few times before you get out the door or pull out the books at home. The color coded calendar. Everyone has a color and once school starts, the calendar starts filling up quickly. We all sit down every Sunday night and look ahead at our week. My advice is to embrace the crazy! There are only so many years of school for your little. Let them lead and hang on for the ride. Organization is the key in our home! Prep in advance and stay organized. Organization is key in our house and kids knowing what is expected of them! Last year my kids were in charge of making their own lunches…2 veggies, 1 fruit and a protein. They loved it and took to it well. So much less for me to do in the evenings and they feel in charge of choosing their own foods. I’m also a big fan of giving ourselves an extra 10-15 minutes in the morning. Start each morning reading your Bible, seek The Lord’s guidance in all you do, and enjoy a cup of organic coffee. I keep the calendar as free as possible the week before school starts and for the first few weeks of school, especially Friday nights because everyone seems to be very tired by then. Ask for help! It’s the only way I stay sane. Taking time with God by taking walks in the evening memorizing Bible promises. Its not always easy find the time but what a boost when I do. This is always the best way. 100% 🙂 It feels amazing and truly refreshes the soul. Good stuff. Plan ahead and have everything on hand for the big day. Pre-assembled lunch ingredients save a lot of time with lunch prep either the evening before or in the morning. Even pre-made breakfasts like instant oatmeal jars or egg muffins are really helpful. It would be great to have to help make changes in habits! We try to get organized two weeks in advance. It helps tremendously! Best way to keep chaos at bay? Plan a daily routine and stick with it! My tip is let my husband help as much as possible. I really could use the fit2b membership. Thank you so much for sponsoring such a generous giveaway. I have always wanted to subscribe to Plan to Eat and the fitness site looks awesome too. And I love that you are including natural resources for my family’s health. Thanks again! Good luck everyone, this is going to be so exciting. When i went to do the giveaway my phone blanked out and it wouldnt let me finish in puting my email. Now it wont let me change it. Is there anyway to update it? Thanks in advance. For me, keeping up with my morning devotions is key to surviving! I’d love to win, but just as much I will love to see who DOES win! Pare down! There is so much we think we “need” to do so I try to bring schooling back into focus and make essentials priority. Great prize! I hope to win! Wowsers! What a give-away!!!! To control chaos…PLAN!!!!!!! My tip for dealing with the chaos of back to school is this: buy a HUGR thing of papers plates and paper products for the first 3 weeks. Dont feel bad about it. Its a sanity saver. Have freezer meals put together so when yiu forget that “oh yeah we had the band meeting, or school meet and greet” or whatever..dinner will already be in the crockpot and ready and waiting for you when you get home. Also: feel free to say no to other things during that time frame. I have one more son with one more year of school! It’been a long time. My daughter is now pregnant with twins…I can’t wait to start teaching them too! I tend to over plan for the coming weeks. As in, I organize like crazy, knowing that something is going to go cablooey. For some reason, this gives me freedom to roll with the craziness that comes when something goes off plan (50% of the time). I just became a stay at home Mom (working very part time teaching music lessons and selling 31) and I am finally going to have time for me. The fit2b, meal plan, and oils would help me get back into shape to be healthy for my two boys and husband. Lists keep me organized! Try to have a set schedule to make it easier on the kids and yourself. Wow! What an amazing giveaway! Thank you for the opportunity! We homeschool, so for me, the most important thing to curb the chaos is just good planning, both for lessons and for meals. My tip is to start early. My tip would be to start early and not wait till the weekend before…..sadly I need to follow my own advice. Stock the pantry with coffee and chocolate! In all seriousness, lots of prep list and organizing go into getting ready for back to school. Start early, and also make sure we have lots of fun those last few weeks! I love Fit2B and that diffuser necklace is lovely!! I’m a veteran homeschooler. I homeschooler 5 and making menus helped keep mealtimes from being chaotic. I’m entering for my daughter who now homeschools her 4 children and just found out her youngest has cerebral palsy. Winning thus for her would be such an encouragement! My tip is to get kids used to getting up and going to bed at the right time several weeks ahead of time. Start your day by singing a hymn with your children. What a blessing to hear their sweet voices lifted tim the Lord! My tip is to get as much done now as you can…don’t wait until the last minute. It always seems like you have more time than you do. Start easing into routines early and give grace! What a fantastic blessing for Mommas. Best tip I can think of is: Get plenty of rest! This is foundation! Start working on the earlier bedtime when August arrives. Lunch planning! I try to minimize back to school crazy by schooling year round. That way if something comes up, we can wait a week or so if we need to. Or we can bring it with us. Definitely get on a schedule and have stuff ready the night before. Starting kindergarten with my oldest after Labor Day….planning gives me anxiety but I’m trying to work on it!